We, Aloft Quartet, are going to record our first studio album in June 2017. This spring we went on a 14 day long tour in Scandinavia, and then we really felt the urge to release our music. For this project, we need your support to cover the rest of our expenses – without you we won’t be able to make it possible. We already have place and time for the recording; a beautiful studio on the countryside just outside of Aarhus, Denmark called Finland Studio. The owner is Jacob S. Worm, a brilliant sound engineer who is going to help us record, mix and master. The music we play is merely our own compositions inspired by everything stretching from the american to the nordic jazz scene. We work on these compositions continuously until we find the right sound and feeling. We first met each other at Skurups Folkhögskola in Sweden and right from the beginning we all felt a very strong musical connection. Our expenses covers four days in the studio – two days of recording and two days of mixing and mastering. Besides that, it will cover the production of CD’s. We also have a deal with Jacob about renting a grand piano, so the quality of the recording will be as good as possible. You will get the digital version of our entire album + a unique picture of the band. The physical CD, as simple as it is. You will receive three CD's to do whatever you want with. Give it as a gift to a friend or let it decorate your bookshelf. We will make an awesome cover of your favorite song! It could be anything from The Rolling Stones to Justin Bieber. We´ll record it and send it to you! You will receive the CD, and your name will be in the list of people to thank on the album-cover. 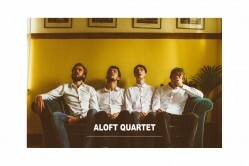 Aloft Quartet will come to your place and play a personal concert!